Please read the Notes tab for important information about frequency blocks and the ranges that are available to you within block 21. 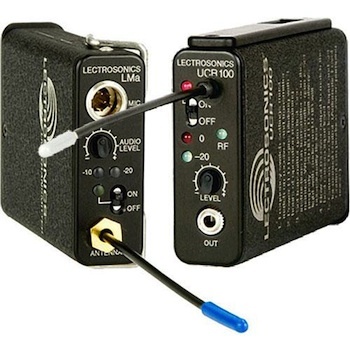 The Lectrosonics 100 Series Wireless UHF Lavalier Mic Set (Freq Block 21) includes a camera-mountable receiver and a belt-wearable transmitter with a Tram TR50 omnidirectional lavalier microphone that can be pinned to a shirt collar. There are 256 selectable frequencies over a 25.6MHz band so that you can avoid interference from local RF sources. To see what channels and frequency ranges are available to you under block 21, please see this chart. Frequency selection is achieved via recessed rotary switches located on the side panel. An easy-access audio output adjustment knob is located on the front panel. The input section features a tap suitable for any microphone or line level audio source. A level dial conveniently adjusts impedance gain levels to accurately match different microphones and line sources. This lavalier mic transmitter/receiver set is ideal for interviews, news stories, and events. • This lavalier set operates within frequency block 21 only. To learn more about frequency blocks, please see our beginner's guide. To see what channels and frequency ranges are available to you under block 21, please see this chart. • Transmitter and receiver must be on the same frequency block and must be set to the same frequency. You will not be able to mix up transmitters and receivers between the Lectrosonics 100 Series Wireless UHF Lavalier Mic (Freq Block 26) Set or Lectrosonics 100 Series Wireless UHF Lavalier Mic (Freq Block 25) Set. • (2) 9V batteries are required to power these lavs (1 for the transmitter and 1 for the receiver) and are not included. Alkaline batteries power the lav for approximately 6 hours (13 hours for lithium).